The real energy debate is not over climate change or carbon taxes or emissions trading. 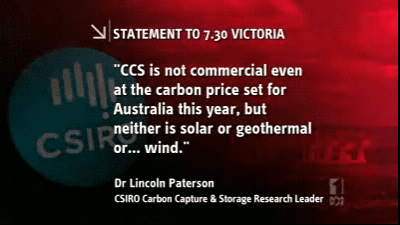 Recent ABC coverage such as "The quest to capture carbon", 16 March 2012, deceives the public with misinformation by two opposing and equally unreliable vested interests. Green groups spruiking renewable energy technology - solar and wind - that do not wish to see competing energy sources maintain market share. The coal industry and the operators of centralised coal-fired power stations that do not wish to see dramatic efficiency gains in using coal energy resources in a way that cuts demand for coal by 50 per cent and dramatically reduces their revenues. GUS GOSWELL: "You are speaking as though the technology has been proven. It hasn't." MICHAEL O'BRIEN: "Well carbon capture and storage has worked in other circumstances." What countries around the world have done and increasingly are doing is converting low-value carbonaceous energy resources, including brown coal, into high-quality methane ("synthetic natural gas"), separating carbon dioxide in this process, and storing it underground. Read more at Three Sides to Climate Debate, Not Two. Synthetic natural gas can be used in high-efficiency Combined Cycle Gas Turbine power stations, in very high-efficiency tri-generation distributed energy systems, as low-emissions transport fuel in road, rail and marine applications, and as a feedstock to the petrochemical industry. Read more and see list of examples at A Tale of Two Shopping Centres. As stated above, the coal industry and the operators of centralised coal-fired power stations have a vested interest in concealing this commercially-proven technology. The suggestion that the industry needs another 15 years to research technology (the statement by Ian Nethercote, Loy Yang Power Chief Executive - at 2 mins 5 secs in the above ABC 7:30 report on 16 March 2012) is a blatantly misleading tactic to allow the profligate inefficient use of an energy resource to continue with large sums of money being paid for coal and energy that are vastly in excess of what is necessary.